I’m intrigued by Moore’s history of flash non fiction. It’s renewed my interest for reading Montaigne’s Essays which has been languishing in my stacks. It occasionally yells ‘read me, read me’ and I say, ‘okay in a few.’ I’m fascinated by all the rabbit trails, authors and essays and magazines to read and absorb. I’ll have to remember that: a tableau, a picture, a moment frozen in time. What does it say? How does it say it? How do you paint a word picture of an grand idea in as few words a possible while still retaining the emotion of the moment? According to Moore, likening the reader to a smoke jumper, you start at the flash point, in the heat of the moment. Kind of scary actually. No build up, no lead in, just jump right in. Will take a bit of practice, but that’s why we’re here. Do we have shorter attention spans caused by internet surfing? Probably. It’s odd that when I read anything on the computer, I skim versus I absorb more when using my ipad. I have no idea what the difference is, except maybe I can curl up with my Ipad which makes it more like a book, versus having to sit upright and tense at my computer. The computer is a tool to me, so yes, I skim to find the most information in the shortest amount of time and move on to something else. Media has changed the way we view things. 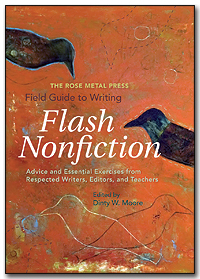 Which I guess is a good thing for those who write flash fiction or flash nonfiction. Which leads back to the field guide and what I hope to learn from the essays. Moore says “literary writing is an art form, and no one definition can ever successfully pin down artistic production or product.” Alrighty then! I'm not going to worry about defining flash non fiction. I’ll work on learning as much as I can, experimenting and see where it takes me. Just keep it short, simple and exciting from the get go. And real, of course. But how do you define real?